Shall we have a bit of fun today? Let’s do so by having a look at an upbeat band based in Nottingham but with members from around Burton so it does count for this section and not another What Else Is Out There, so nyer! Either way, be careful not to get trampled by Big Rhino! Richard Bendelow (lead vocals/guitar), Andrew Gibson (lead guitar), Paul Gibson (drums) and Miles Pugh (bass) make up this four piece party rock band who despite having set up camp in Nottingham, most of the members are Brewtown through and though and perform in Burton quite a bit! But with a name like Big Rhino, you’d assume that they can bring a lot of noise and stomping to wherever they perform and have a right silly time along with it. Let’s explore and see what we can get out of this piece on these guys! If we can’t, we at least have this brief summary image! The history of the band stems from a number of places, both geographical and musical, with each band member having their own story to tell before they got to be a part of the giant rhinoceros. Bendelow, the Gibson brothers and Pugh all eminate from and around Burton, Yoxall, Barton and Coton-in-the-Elms more specifically. They also studied at John Taylor High School where members from Get Cubs and Max Raptor studied which has been covered in this piece about the latter. Paul Gibson and Pugh were once business partners at their own local promotion Pink Boards Records which in essence was meant to add some much needed colour to a quite harsh and angry scene. This idea however does clash with Gibson’s band around that time called Invey who described themselves as a “hate fuelled, hard rock band.” Can’t fault diversity I guess! Nor the brightness of those lights! Invey themselves have had a lot of success themselves as a Midlands band, touring all over the country from the mid to late 00s supporting the likes of Children of Bodom and Nightwish. But of course this is still about Big Rhino so we should probably get back to them. Richard Bendelow and his brother Rob were a part of a revival of the successful 80’s Derbyshire band Saracen. After they decided to call it a day around 2012, Richard met up with good mates The Gibsons and Pugh and thought about forming their own band. They each thought about bringing together a big four way rock band dynamic whilst still maintaining the fun spirit of Pink Board Records to form a party rock band (LMFAO and Andrew WK would be loving this!) and this is how Big Rhino came to be. Not before some assisted planking though. They started writing and recording in the Autumn of 2012 in Base Rehearsals in Nottingham which is why they would be known as a Nottingham-based band although most of them were Burton-based to begin with. Their first gig came in Nottingham as well with the Creative Christmas Party in December that saw them being well-received by the audience even though they were on first which is always a good sign. As 2013 came, so did their first EP that they had been working on towards the end of 2012. Turn Around Baby was released on January 11th and featured songs such as Perfect Guy and Tom Bombadil. Bombadil’s mushrooms must have been passed around at some point! After the EP release, they released their first music video for their song It’s Just The Way We Are in February which has over 2000 views as of this date. This along with their free EP release had garnered a decent amount of buzz amongst their friends and Midlands music fans that they expanded their reach from just Nottingham. Speaking of, they also were working with and gigging with other local musicians at this time such as recording with Dan Shipley of Burton metal band For The Kill and performing at The Shed in Leicester on the same bill as Exile84. Throughout Spring, they would do a few gigs in Burton such as the Star and Garter in March and the grand re-opening of the Wetmore Whistle in April along with the aforementioned Exile84 and Great Scott. A very positive review came for the band after they performed at the Dot to Dot Festival in May at the Rescue Rooms in Nottingham where they were described as “a highlight, playing a fun and uplifting set that ranged from surfer rock to indie pop that at times wouldn’t be out on place on the soundtrack to a Tarantino film.” Django Unchained 2, you have some party scene BGM! In the Summer they played everywhere from Ashby’s Bunka with with The Decade Runners and a protoypical Red Monroes, Waterfest in Nottingham and Summerfest in Derby. 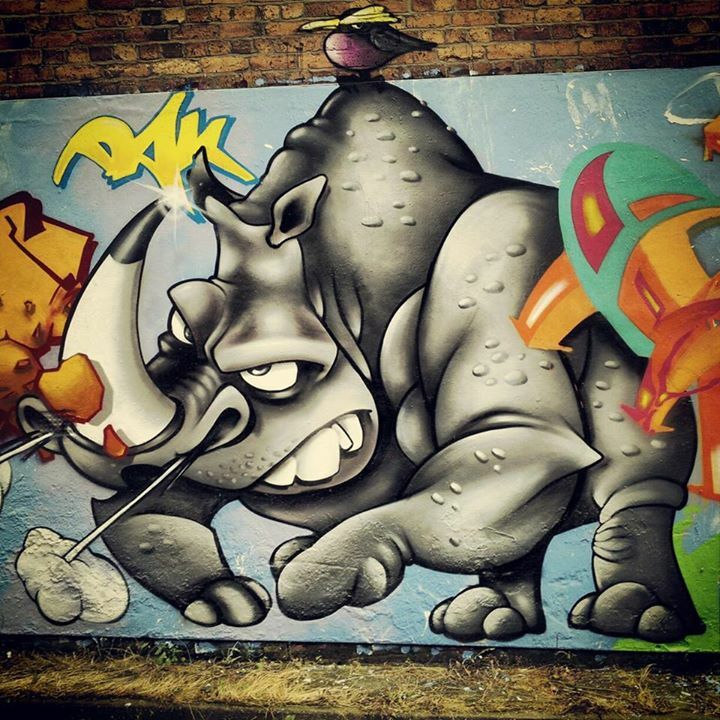 Definitely full momentum for this Rhino! A weekend mini tour came for them in September with Murphmania at Barton on the 6th, Amazement Festival at Nottingham Racecourse on the 7th and the Barefoot Walk In The Park at Woolaton Park, Nottingham on the 8th. A particularly glowing review came for them after their Amazement gig: “It’s impossible not to smile and have a cheeky dance to their surfer gypsy pop rock. The most striking thing about the band is how much they clearly love to perform, always a must for any band worth their salt.” Gypsy pop rockers, haven’t Green Fortune got that honour? No amount of praise would prepare them for October’s Big Money gig at The Star Foundation in Burton though! A huge charity even with a Jools Holland type of set-up of multiple stages with two acts a stage also featuring the likes of Black Wolf Catch, Exile84 and Get Cubs. 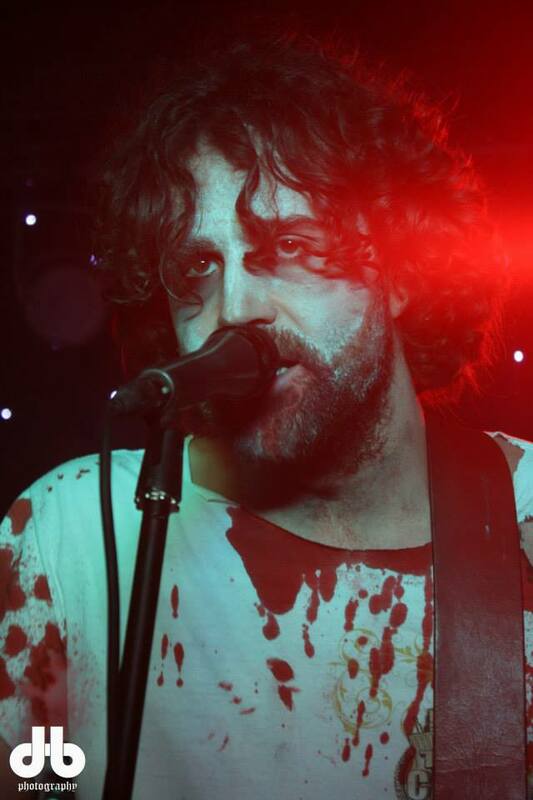 Oh and a back-up singer from Jon Coulton’s Re: Eat Your Brains! All in good flesh-eating fun! One last huge gig for 2013 was post-Xmas at the Wetmore Whistle with their 2nd EP launch simply titled The 2nd EP. Straightforward I guess. Supported by For The Kill and Sleaford-based math rockers Bear Makes Ninja, they were met with rousing, happy na-na-nas through to the New Year. Now to this current year of 2014, they also received good feedback for their music video for first track from their sophomore effort People which featured footage (stock or made by the band themselves) from around the world! With their EP being made available to stream on Soundcloud in February, the followed that up the next month with a big card on a bizarrely placed gig. Phoenix Salvation‘s last gig and free EP launch saw BR as well as Star From Ivy and Black Wolf Catch feature in The Goodridge which is a Burton-based Wetherspoons chain. Who said pubs have to have unique identities? In between recording their next batch of material, BR supported New-Zealand alt-rock band Kobosh (best have been worth the millions of miles!) a Nottingham’s Chameleon Arts cafe in April, as well as finding out they’d once again be a part of the Waterfront Festival (which takes place July 12th) after a successful BroadgatesFest near Nottingham Uni in June. Kobosh! But after all that charging through the scene, how does Big Rhino hold it’s horn (stop snickering!) in said scene? 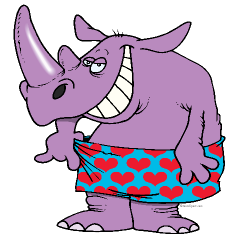 Deep down, everybody wants to have a little, silly fun once in a while and if that had silly fun had an iPod, Big Rhino would somehow always come on shuffle! 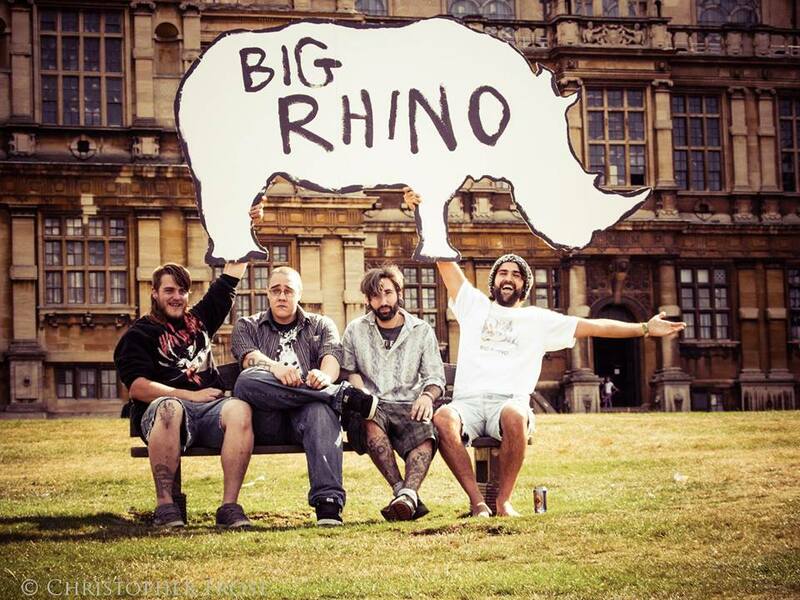 With the aforementioned label of ‘gypsy pop rock’, Big Rhino take surf rock, funk and reggae to make a joyous sound that always seems to win over even the most cynical of audience members. Bendelow’s enthusiasm combined with the Gibson bros’ and Pugh’s wily musicianship will get people on their feet, spilling their beers in the process of partying hard! The first of two recommended songs is Just the Way We Are, the final track from their debut EP. The spinning opener Turn Around Baby and Tolkien toe-tapper Tom Bombadil were good bracers for this track which brings an end to a short, but worthwhile party bringing a sense of togetherness and acceptance to the proceedings. With a rhythm and bass line that will remind you of BBC Test match cricket (no seriously, look up the theme by Booker T and the MGs and listen), the light-hearted nature of the song is a great solo introduction to their sound and will prepare you for the live merriment! Definitely not one to be taken seriously, but would they want it that way? It’s the good time that counts and you will have this listening to this one! The second song to recommend is People from The 2nd EP which does allow them to be a bit more diverse with their sound with tracks ranging from blues rock (Under The Sun) and a bit more an indie flavour (Over) and while a sing-along stomper does sound like it fits in with their previous party anthems, it still stands above them as a bit more socially conscious while still being humourous and carefree. The tone can change lyrically be it from serious (Let’s sing songs about things, songs about the people that we love and the predicaments they find themselves in) to downright silly and lewd (Let’s go down to Tesco! We’ll buy a bottle of rum, have some fun on the desk that I took your virginity on! ), but musically it stays at an easy yet brisk pace until it goes into a Capella way-ohs from the audience before we call it a day! The video featuring all kinds of footage helps the universal feel to this song showing that we are all just people who have our own lives and what’s up with a bit of a break in that monotony to just relax, have a drink, have a sing-song and then go home? If you feel that way, give it a listen, or not depending on if you value my opinion in any way, shape or form! To finish up, Big Rhino are there for you if you need a shindig, rave or hootenanny (maybe even a box social!) and some fun, catchy music. 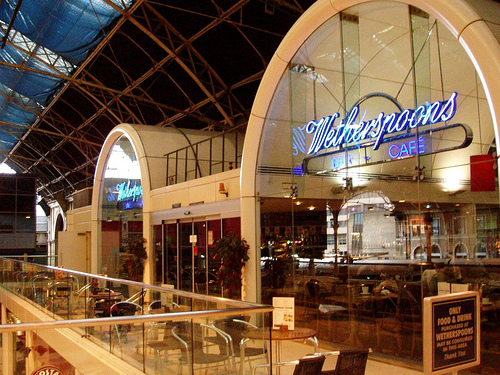 While Nottingham may be their stated home for now, Brewtown is way they originated so…you’re welcome Notts! This has been Brewtown Music, serving another fresh batch of local tunes. 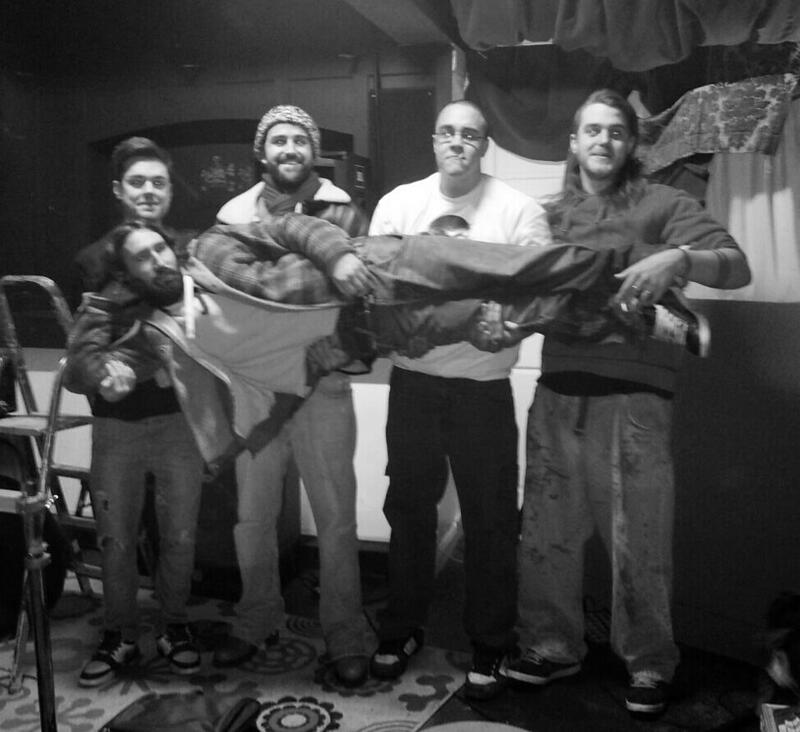 This entry was posted in Local Music Profiles and tagged Arch Creations, Barton, Bendelow, Big Rhino, Burton, EP, Exile84, For The Kill, Gibson, Invey, Nottingham, People, Perfect Guy, Pugh, Turn Around Baby, Wetmore Whistle, Yoxall. Bookmark the permalink. Brewtown #24: Brewtown does YNot! 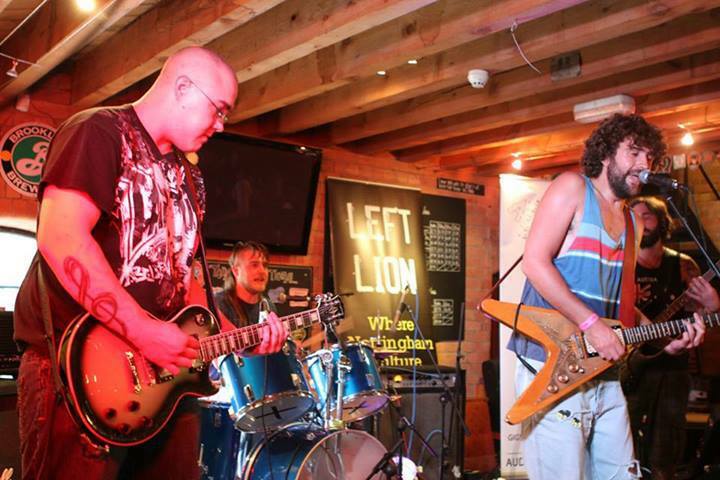 Check out this excellent write-up about Big Rhino who are playing The Barefoot Walk for the second year in a row on Sunday 7th September – come see them LIVE – they were great last year!